It's been a busy old month! But I have still managed to get out and about and find some gluten and dairy free treats! This month the variety hasn't been as good as previous but if you like chocolate or quick and easy meals then keep reading! My friend has been telling me to find this and try it for years now, because I said I really miss the taste of proper white chocolate. This iChoc white vanilla flavour has the taste and texture of a Milkybar! If you are looking at eating healthy but want to keep it within a budget, then by far my best tip is to buy in bulk and check out the ethnic aisles of supermarkets. I managed to pick up these rice noodles for 80p! 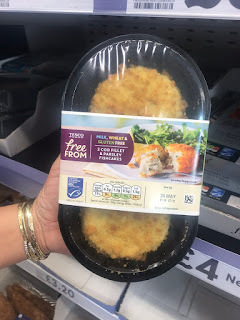 And I have only used a quarter of the packet for one meal so far, and they only take 5 minutes to cook in boiling water, so there is no excuse to make a healthy fresh dinner in the evening! But Tesco have once again come to the rescue! These fishcakes are so big and chunky, I simply cooked one in the oven and served it with some vegetables and garlic mayonnaise. Such a quick and simple dinner and they taste lovely. Who doesn't love a good old cod and chip dinner? If you buy this from the chippy down the road, not only will you be buying something that has been deep fried and isn't great for your heart and cholesterol levels. However, Tesco have released a fresh packet of crispy cod fillets. They are a really good size and the fish inside is really fresh! Serve with veggies, salad and some homemade chips for a perfect Friday night dinner! 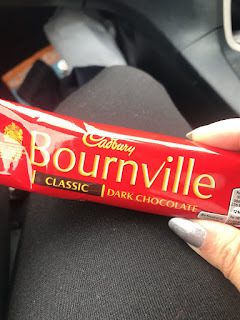 During the bank holiday weekend we stopped off at the services and I fancied a little treat (aka, I was hungover and wanted chocolate!) 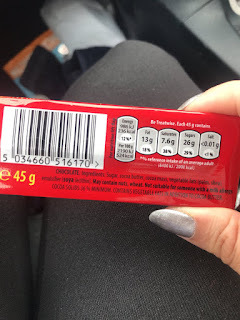 so I looked through all of the chocolates to see if there were any that I could have and I was pleasantly surprised to find that Bournville is free from gluten and is free from dairy! It was nice to be able to enjoy Cadbury chocolate again! Please note that it is not appropriate for someone who is allergic to milk, due to the manufacturing methods. After a brilliant night in Liverpool, breakfast was needed and I took to Twitter to find the best spot. Jam is a cute little restaurant in the heart of Liverpool with a very modern style. I had heard from quite a few people that they offer a good gluten free menu, but when I asked for the gluten free menu, they said they didn't have one... but they could make anything I wanted off the breakfast menu free from gluten for me! So. Much. Choice. But I went for the 'Eggs Americana' which consisted of Poached Eggs, Avocado, Spinach, Tomato, Sauteed Potatoes, Asparagus, Caramelized Onions, all on gluten free toast! The staff there are so lovely and even ran to the shop to get me some soy milk for my coffee. Definitely worth a visit!